Detective Henry Palace has a whole host of problems. He’s got a moon bat sister whose equally ditzy husband is missing. His fellow detectives no longer seem to be taking their jobs seriously. He’s got a dead body hung in a McDonald’s washroom that everyone from the district attorney to the forensic examiner has determined is a suicide, his protestations to the contrary notwithstanding. He’s also going to be dead in six months. When it was finally determined that a 6.5 kilometer asteroid known as 2011GV, a.k.a. “Maia” is definitely going to hit the earth within six months, society fell apart. Many people quit their jobs to pursue their “bucket lists”; many others chose to end things on their own terms, with pills, a gun, or dangling at the end of a rope. Still others continued on with their daily lives through force of habit, either pretending nothing was wrong or simply not knowing what else to do. Henry Palace is one of the lucky ones, in that he’s right where he wants to be. He’s dreamed of being a detective since childhood, and finally realized it in the months preceding the discovery of Maia. End of the world or not, Palace is doing what he loves, so when Peter Zell, insurance salesman and purveyor of pretty much the least useful service you could think of in a pre-apocalyptic world, ends up hanging from a belt in a dirty washroom, it looks like an open and shut case of suicide. At least it does to everyone but Palace. Something’s just not right, something innocuous, but curious at the same time. If you’re going to kill yourself—why buy a new belt? 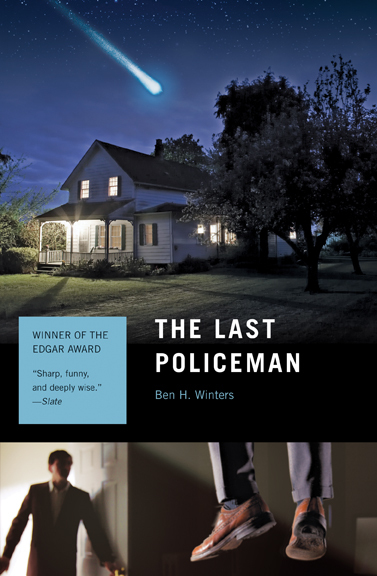 Thus begins Ben H. Winter’s Edgar award-winning, The Last Policeman, a novel which explores what it means to solve crime in a world where it really doesn’t matter. The Last Policeman is a police procedural in unusual times. Henry Palace has to deal with both a dysfunctional society and the eroding infrastructure of a fictionalized Concord, New Hampshire which only gets worse as the end nears. Basic modern technology such as the internet and cell phone service are spotty at best. Simple forensics such as toxicology reports are hard to come by, and even fueling a departmental car is a daunting proposition. A man who prefers a life of structure and reason, Palace is stubbornly rule bound and methodical, yet willing to bypass those investigative rules–if necessary–in his dogged pursuit of the truth. He’s also got a well-honed sense of decency. Where a meal costs tens of thousands of dollars due to the collapse of the banking system and the resulting hyper-inflation, he still tips well, even though he can’t really afford it. When he discovers an unsavory aspect to the deceased Peter Zell’s past that might explain suicide as a likely scenario, he doesn’t just bow to popular opinion, and when his sister implores him to find her missing husband, family duty requires he follow-up. The list of possible suspects is short, but the author provides us with enough theories that the reader isn’t aware of the culprit, or even if there is one, until late in the novel. Was it Zell’s boyhood friend with whom he had a falling out? Could Zell’s suspiciously disinterested sister or her family have a role in his death? As an insurance salesman unlikely to pay out policies in the face of the apocalypse, could it be a disgruntled customer? And what is Zell’s connection with the charming Ms. Naomi Eddes, personal assistant to his boss and first noticed by Palace as she hurriedly walked away from the McDonald’s Zell’s body was found in? When I started reading The Last Policeman, I expected a maudlin and depressing novel. After all, he’s writing about the futility of doing your job when you know it’s most likely all going to end within a short period of time. However, in Henry Palace we find a case study of a man who is, as I said earlier, right where he wants to be. True, I’m sure he doesn’t want to be facing the apocalypse, but lacking an alternative, he’s making the best of a bad situation and relishes the thought of a mystery he can solve. Palace obviously has a strong sense of duty, taking his job seriously while others simply go through the motions, but the reader gets the impression that his determination to prove this suicide is not suicide stems not just from duty, but also an unwillingness to accept what he feels in his gut is wrong, and maybe an attempt to resolve demons from his own past. Perhaps in the end, he feels he owes it to history to wrap up the details, and not allow Zell’s death to be misrepresented. The Last Policeman is written from Palace’s point of view in a style that constantly demonstrates his methodical nature, both dealing with those around him and with his investigation. It’s also a broader look into dealing with the unthinkable, whether people will rise to the occasion or sink into behavior that at any other time would be unconscionable. Ben H. Winters deserves much kudos for a thoughtful and intelligent mystery that has garnered him an Edgar award for “Best Paperback Original” of 2013. 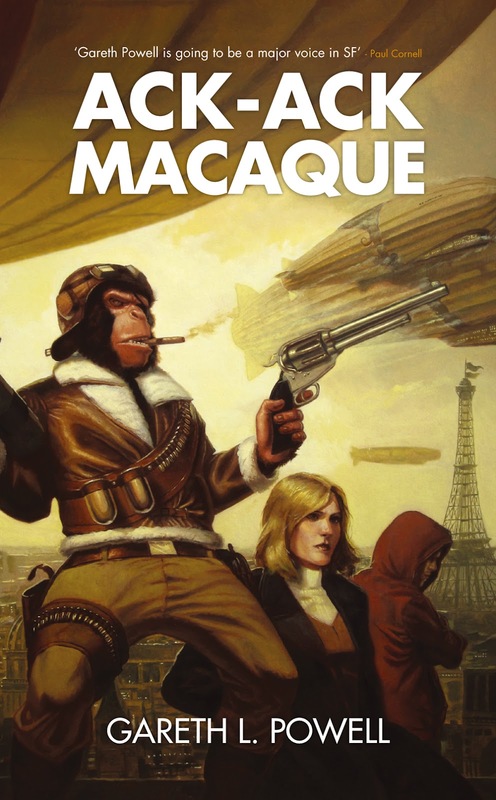 It’s also the first in a trilogy of his apocalyptic mysteries featuring Henry Palace. Winters’ second novel, Countdown City, is out now.